A hot topic over the years in hitting has been the debate over whether a baseball swing and softball swing are different. Let me preface my answer to this debate by saying, I’ve been in “the game” almost 40 years now. Have coached for over 17 of them. 13 in baseball and 4 in softball. I’ve worked with several MLB hitters including a starter in the 2015 All-Star Game. I’ve also worked with several Pro Fastpitch Softball players. Let me be clear: A good swing is a good swing. Baseball. Softball. The Same. Although most coaches, parents and players already know that… if you are still in doubt or don’t trust my experience and expertise, let me help you in your journey from the dark side to the light. For coaches that believe the swing is different, one of the first things that comes up in their argument is the rise ball in softball. Yes the rise ball goes up. Yes it’s a traveling on a different plane than all of the other pitches. No, baseball hasn’t figured out how to defy gravity just yet. My least favorite option. In this option, a softball hitter would recognize the rise ball and instead of having a “baseball” style swing, they would mid flight realize it’s a rise ball and then decide to have a different “get on top” downward swing plane. If you follow me on social media or are a member of The Hitting Vault you know that a downward swing plane on any pitch is not a great swing path and not what elite hitters do in either softball or baseball. 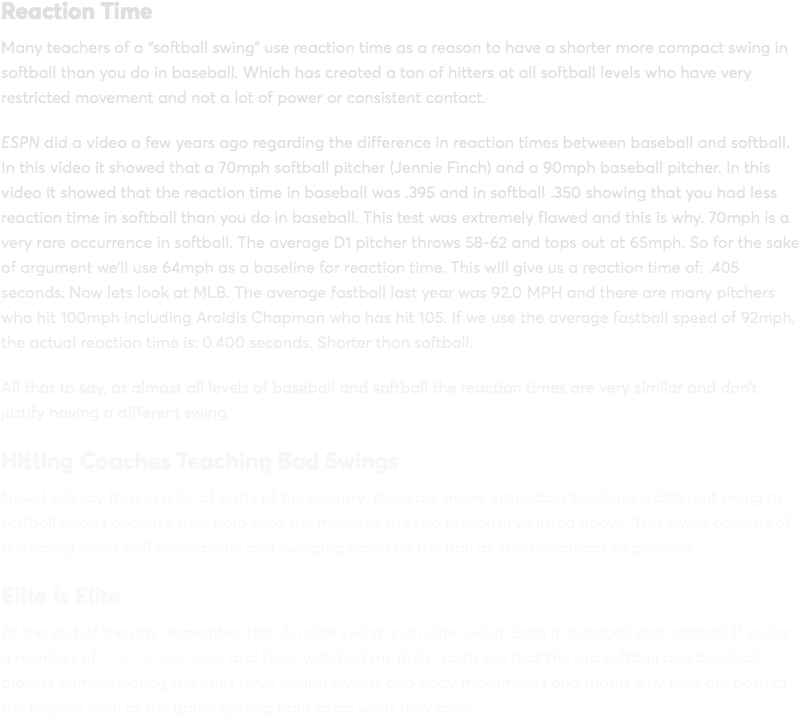 Not to mention that the reaction time for both softball and baseball at the higher levels is less than .4 seconds. Not enough time to process information and have a different swing. There is a much better option. Although it is difficult to do at times, the best softball hitters do their best to avoid swinging at rise balls. Period. In my experience and those of many D1 college coaches, less than 5% of rise balls finish in the strike zone. And usually that 5% was a mistake pitch that gets hammered at the top of the zone by the batter. The only exception to this rule is what we call the Low Rise. This pitch has late upward break, which makes it difficult to hit. There are millions of softball pitchers from 8 years old to 38 years old and I can count the number of pitchers who can throw a low rise with one hand. It was created to teach athletes how to move their body to unlock their most powerful swing. It’s designed to help coaches get optimal results from their athletes. Join and get access to over 100+ exclusive videos for members and step-by-step instruction so you’ll know exactly what to do next to unlock your power at the plate.